Home 'n Hosed: Meeting the Easter Bunny! Today, Ethan and I went with his Grandma Wade to meet the Easter Bunny at the Coolsprings Galleria. Since we were able to go during the middle of the day, there wasn't a wait, which was good, because we had lots of time to try to make Ethan smile for the camera (something I have a hard time doing sometimes). 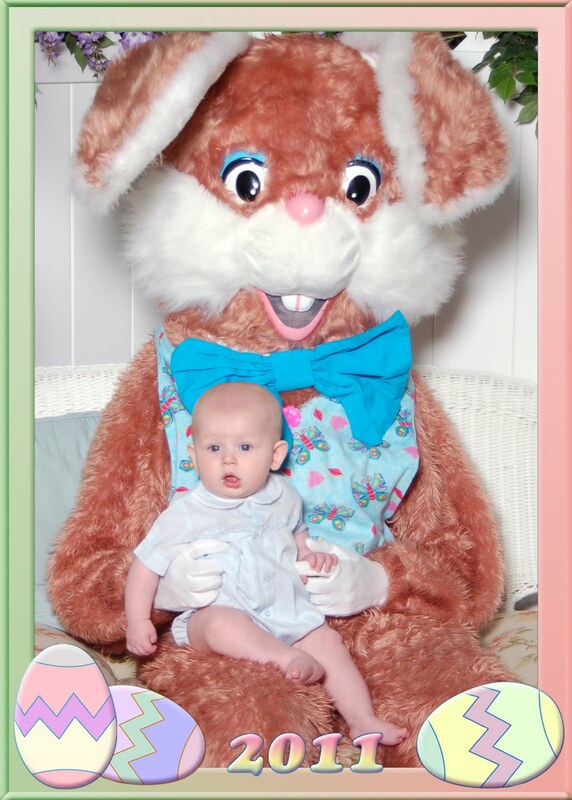 Unlike with Santa Claus, Ethan was wide awake for this adventure and was giving smiles to everyone before I introduced him to the Easter Bunny. He was happy to see the Easter Bunny, but when it came time to "smile for the camera" he was much more interested in looking around...he was so mesmerized by the Easter egg trees and other decorations that he didn't smile at all -- he just wanted to take everything in. We ended up with a cute bright-eyed photo anyway!! I'm sure the Easter Bunny will bring him some fun treats on Sunday! Cute picture. And I love his outfit too!